The second color on our journey through the visible, spectral rainbow is ORANGE, the joy of being alive! This color is not hot like RED, but it is still energizing and activating in a gentle warming way. Orange stimulates our creativity and its joyful qualities are a great antidote for depression and loneliness! As with all the colors, Orange has important messages and wisdom. This color is exciting. Orange is wisdom and compassion, communication and cooperation! This color is all about vitality and creativity. This color inspires us to paint, cook, write or sculpt. It inspires us to be CREATIVE in the ways that are uniquely us! And, when we are creative, we are serving humanity with our gifts. Because of these qualities, Orange inspires physical health, communion, celebration, sharing, giving and receiving. Wow, I love this color. As a color therapist, I always use Orange for sadness. And, let me tell you, it does exactly what it’s supposed to! It packs a VERY powerful punch! Orange is associated with the second or sacral chakra, Svadhisthana. Svadhisthana means “sweetness”. It’s powerful to understand that Orange is associated with the sweetness of life. This means pleasure, nurture, movement, change and yes, sexuality. It’s associated with what makes life sweet! The sacral chakra is associated with the water element and the moon. The Orange color takes us out of survival to the nourishment of the soul through creativity. It’s also very much about sexual desires and passions. The Orange in our Sacral Chakra moves us from basic existence to embrace what makes life worth living. It takes us beyond tribalism, to establish the “self”. Orange is a combination of red and yellow, being more powerful than the two others individually. Orange is linked to the reproductive area; hence it’s associated with nurture, receptivity, and emotions. The sound associated with the second chakra and Orange is the gentle sound of water flowing in a brook. This sound gives us a sense of calm and wellbeing, peace and harmony. By using the power of Orange appropriately, we can more easily release and digest emotions. Orange stimulates and increases the pulse rate, but it does not affect blood pressure. The Orange frequency expands the lungs as a respiratory stimulant. Orange is the spectroscopic color of calcium and therefore aids in calcium metabolism. Orange stimulates milk production after child birth. Orange has so many wonderful psychological effects. Orange stimulates a sense of well-being and cheerfulness. It’s the color of ideas and creates warmth and prosperity! As with most of the colors, we receive Orange through sunlight, through the colors of nature and through food. 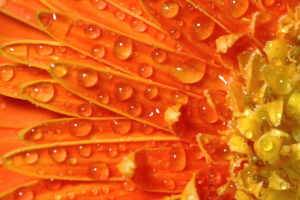 Nature provides Orange through a sunrise, through the Orange marigold, Orange chrysanthemum and Orange lily. Birds and butterflies carry the vibration of Orange with their color. Food provides Orange through oranges, pumpkins, carrots, papaya and orange peppers. It’s everywhere, my friend! These are just a few of the ways that nature provides Orange. Take notice and observe where nature is giving you Orange! Stay tuned for Yellow, the spirit of Divine Intelligence!